But now it's back to the grind (such as it is) where we've been busily preparing several new fixed departure experiences that are chock full of adventure and 'privileged access' to untold stories. In a forthcoming newsletter I'll post information about the trip to Cambodia we have scheduled for late May, 2014. This trip is aimed at new filmmakers and is priced accordingly. It will be the lowest cost Filmmaker Abroad trip this year. If you can't wait to find out more about this unique experience send me an email and I'll provide you with the latest information. It's limited to just 12 places, so if you are planning to book, do so early. We expect it to be fully subscribed quite soon. There's also a trip to Far North Queensland that's ready to roll. Email me if you fancy doing some underwater filmmaking while staying at one of the most beautiful private islands in Australia. This trip is being offered in partnership with The Tailor, Australia's top experiential travel agent. I'll post more information about this trip in the next newsletter. But this newsletter is all about Spain! The best time of year to be in Northern Spain, in my view, is June when there is a festival in seemingly every village. The next newsletter will feature the Italian Itinerary which is scheduled for late July/early August. A great time to be in Italy for the same reason. So... without further ado, here's a sneak peak at the itinerary for two wonderful weeks in Spain! We’ll meet you at the airport for your private transfer and whisk you off to your accommodation, the stunning Hotel Casa Fuster, a modernist architectural gem in Passeig de Gràcia, nerve centre of the city where other emblematic buildings such as Casa Gaudí are located. In the afternoon, after you’ve freshened up, come along to the relaxed briefing at the hotel. It’s a chance for you to get to know your filmmaking mentors and tour guides. The emphasis is on fun. You can; creatively engage with story possibilities, familiarise yourself with the high quality equipment, have all your questions answered. Notes on filmmaking, and the stories that await you, are provided. But most of all we want to hear from you. What do you hope to get out of the experience? We understand that everyone has slightly different expectations in terms of their creative vision, and we want to tailor the trip to meet your exact needs and desires. We welcome couples where only one of the two is interested in filmmaking, and we will make sure that the non-filmmaker is fully entertained and well cared for. This also applies to family groups where not everyone has come to make a film. And my co-host Dominic Bonuccelli is a world-class photographer, so if you want to take stills or learn how to get the best out of your DSLR we can accommodate that too. Set off after breakfast for the picturesque village of Berga. It’s a one and a half hour drive from Barcelona, and it’s the best time of year to be there. The entire village is preparing for a week of celebrations known as La Patum, declared a ‘Masterpiece of the Oral and Intangible Heritage of Humanity’ by UNESCO in 2005. 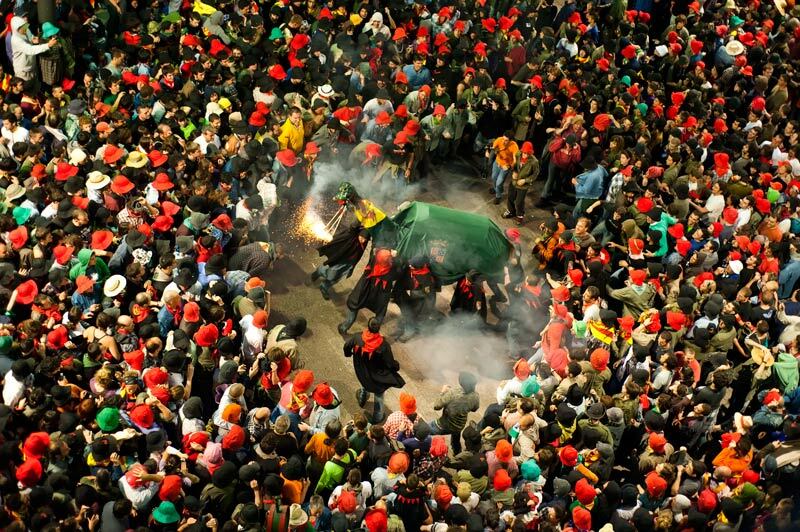 La Patum’s roots can be traced all the way back to the Middle Ages. The multi-day event is based around a series of theatrical performances which would have originally been pedagogical in nature, created to educate the congregation in morality by enacting teachings from the Holy Scriptures, now they are much more festive in nature. By midday on the 18th of June we will be in place to capture the "Passada" where the "Gegants"(giant papier maché anthropomorphic figures) walk the city to announce the opening of La Patum. As the procession winds through the ancient streets we’ll witness the mood of the following crowd becomes progressively more boisterous. The festivities are now well and truly underway - and they’re going to continue in this vein for several days. Anyone can simply watch, but we’re offering you the chance to get inside the story of this curious marvellous event. The performance culminates with the ‘Tirabol’ - wherein the whole village rejoices in having cleansed themselves of evil. It’s a public outpouring of emotion expressed through song and dance, around the figures of the ‘gegantes’ and the ‘guites’. We will provide you with knowledgeable support staff, extensive background notes (it’s a complicated and mysterious festival) and access to characters and stories. You are here to make a film, have a rich immersive experience, but you can be involved as much or as little as you want. Wrap up your shooting after breakfast. Today is a travel day and we are setting out for our next adventure. By mid afternoon we’ll reach our destination, the tiny magical village of Castrillo de Murcia. You’ll find, El Colacho, the main character of this festivity, already in the streets whipping the kids with a horse tail while the villagers insult him as he rushes about. Tomorrow is the main day, and El Colacho will be playing his pivotal role. Today is a chance to set up your story, do a ‘recce’ of the locations and if you wish, interview El Colacho. Balconies are decorated with flowers and tomorrow mattresses will be dragged out into the cobbled streets and the villagers will lay their newborn babies down and wait for El Colacho to jump over them. Accompanying him will be a religious procession moving steadily through the charming streets. You can learn more about the roots of this ancient event, and become part of the story yourself. Now you are not simply watching, but participating in, one of one of the most bizarre festivals in all of Europe! It’s the day of the festival, which dates back to 1620. 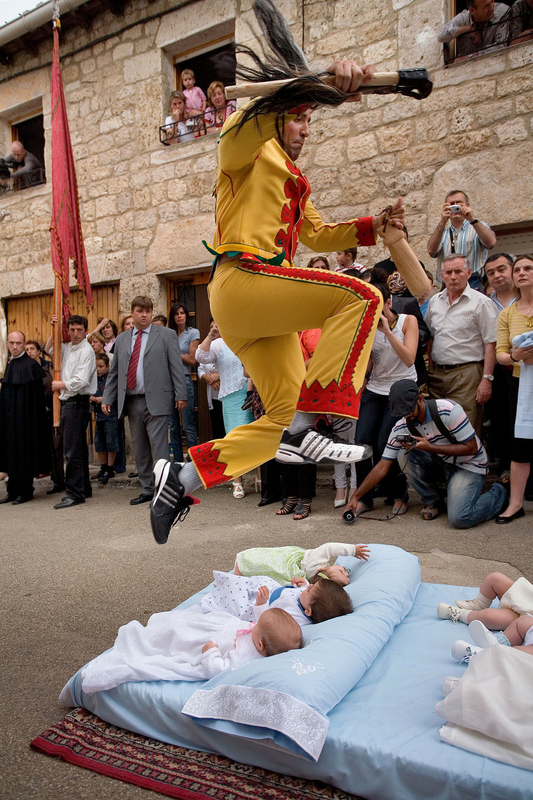 The ritual of jumping over babies was thought to bless the newborn children and remove original sin, preparing them for a life on God’s true path. There’s another beneficial side effect: the babies are protected from illness. Who needs expensive medicine when the very devil himself has purified you? Though Church officials have pressured local priests to discourage Catholics from taking part in El Colacho, the festival is still a vibrant tradition, replete with a musical procession through the village with El Colacho chasing the young and old, while teenagers in lederhosen dancing an Irish jig. Yes, it’s all a little surreal. 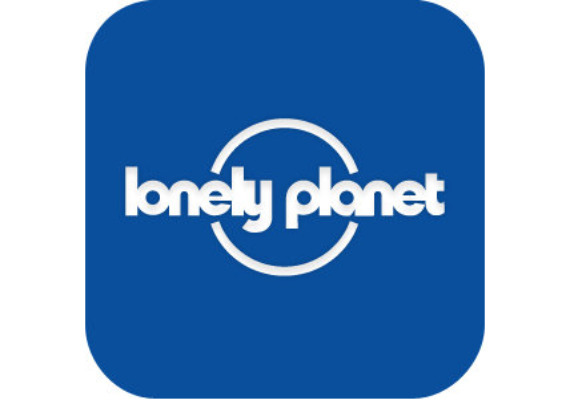 Click here to watch a short video co-host Dominic Bonuccelli made during El Colacho while on assignment for Lonely Planet, in a series I produced for Nat Geo a couple of years back. A short drive to San Pedro Manrique (our home for the next two nights) where things are really hotting up. On June 23, the “Mondidas”, (three chaste young girls, chosen every year from the community) head the procession that winds through the village’s streets to indicate the opening of festivities. These leading ladies will be wearing their “visperas”, but the following day a two-hour ritual takes place at their homes involving wise elderly women from the village. They will reemerge wearing traditional “traje”, a dress in which every detail has symbolic value. We have privileged access to this preparatory event. Female filmmakers will have an advantage in terms of access here. 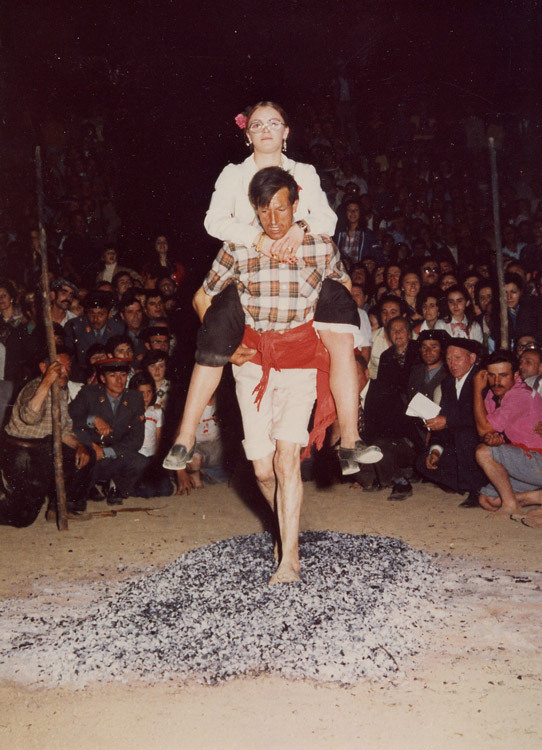 After this preliminary procession many of the villagers go to collect wood and prepare the bonfire and subsequently the embers, because “Paso del fuego” means literally fire-crossing, and at midnight ,villagers that dare, will cross this “fuego” barefooted. You can follow the story of one of these brave men, or we may even be able to negotiate access to allow you to participate. At midnight of the 23th the festivities begin in earnest. Some of the villagers cross alone, while others carry their child or a relative on their backs, an action that usually has to do with religious pledges and wishes. You may have guessed that the brave young women, the “Mondidas”, must cross first. They must also recite a poem ( which they’ve written themselves about the events that have taken place in the village during the last 12 months). After the poem, a traditional “jota” is danced and an open-air dance begins. Music, joy, beverages and dances signify the culmination of this fabulous fiery festivity. This journey has been, in part, about giving you the sense that you are working as a professional film crew - and a rest day is also part of that experience. But don’t worry, we’ve got some delicious treats in store for you if your energy levels demand more action. Marqués de Riscal Hotel is the place we’ve chosen to chill. 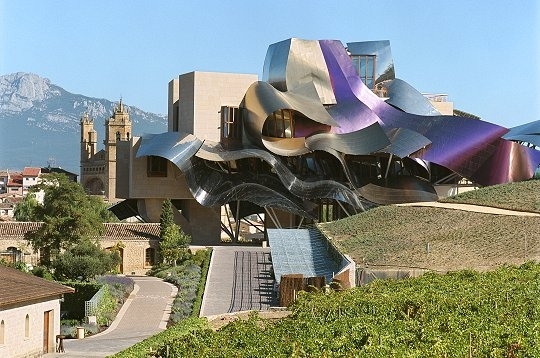 This architectural wonder is located in Laguardia village, in the heart of the wine producing region of La Rioja. A luxury hotel designed by Frank Gehry, it offers its clients not only a beautiful environment and a prestige spa but also access to one of the oldest wineries in Spain; and it’s our home for the next five nights. The last and possibly the best of our accommodations during the two weeks. There’s a lot to see and to taste in La Rioja. 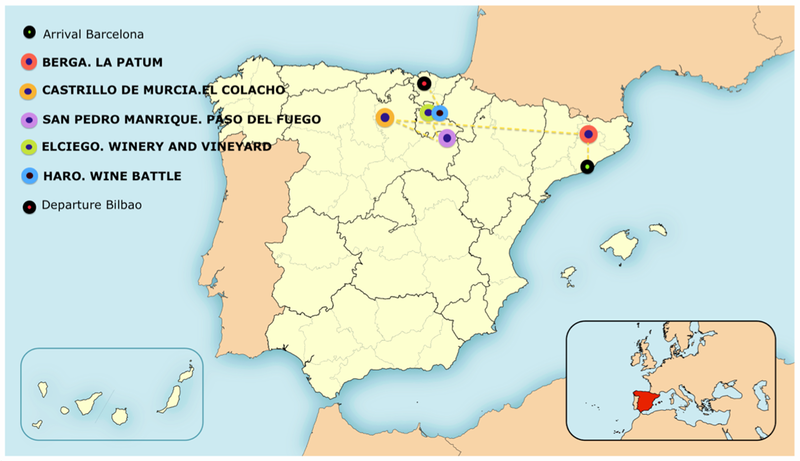 Today you can relax in your luxury accommodation or join us on an excursion to some of the most prestigious “bodegas” of Spain. The tour starts at our front door, at “La Catedral”, the old wine cellar of the Marqués de Riscal winery. Enjoy “catas” (wine tasting sessions) where you will get to know the definitive characteristics of the Rioja varietals and learn a little about the “Rioja” wine making style, a process that has made this certificate of origin one of the most well-regarded in the world. Even for wine aficionados this will be an eye-opening experience. The Spanish tradition, varieties and wine “grammar” differs from the better known French, Italian and New World traditions. You can spend the day simply soaking up the wine culture, or you can film a micro-doc about Spanish wine that can culminate in the events of Sunday at Haro. Whatever takes your fancy! Soon, it's time to unpack those white clothes and ski goggles, and try to figure out some kind of battle strategy while we get you your water-pistols. Confused? I hope not, war is about to begin! 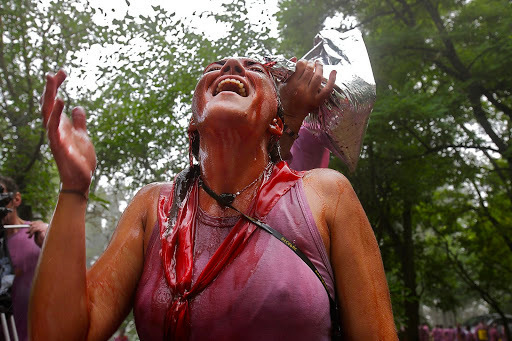 In the place known as Riscos de Bilibio, 6 km from Haro village, an ancient ‘romería’ (where pilgrims used to splash themselves with their wineskins) has evolved into a crazy battle in which hundreds of people “fight” with litres of wine as ammunition. Musicians play under the trees while participant’s white clothing slowly turns a deep purple. 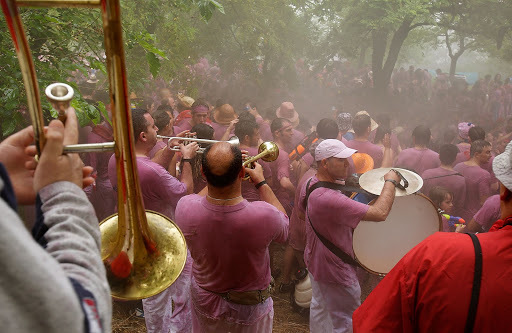 It’s a swirl of musical instruments, colourful plastic children’s waterguns, in the shade of ancient trees, in this quirky bacchanalian party, surely one of the most fun in all of Spain. Hit record on your waterproofed camera and jump on in! Time to reflect on your incredible two weeks in Spain, perhaps nursing a little hangover. We’ll transport you safely to the airport in Bilbao, just over an hour from La Rioja, for your afternoon international connections. Or, if you’d prefer to spend a few days in Bilbao, let us know when you book and we can arrange everything for you, at an extra charge. The Guggenheim Museum is well worth the visit. Before you set off we’ll deal with some of the more prosaic aspects of filmmaking like ensuring all your rushes are properly logged and backed up, so that we can take them to be edited into your own original film. Feel free to add notes, narration ideas, research info, scripting in any form you wish. You may also have music suggestions or even links to programs that you would like to think of as ‘style guides’. Then it’s fond farewells until we speak again in 3-4 weeks by which time your film will have been completed and delivered to you to share with your loved ones. I hope you've enjoyed this newletter, and in particular the details of the 'Get Festive in Spain'. Watch out for next months newletter with information on the Italian itinerary and Far North Queensland. If you have any further questions, or want to know how to book a place on one of these trips just drop me a line, and I'll do what I can to assist you.